"New wine must be put into new wineskins" (Luke 5:38). I would like to share with you in this little book, something that the Lord has been doing in my life over a period of many years. It is a way of life that has become very precious to me because, like everything of eternal value, experiencing it has involved sacrifice. If we really seek to understand the teaching and the life of Christ, it will bring us to a cross - a cross where we will have to give up some cherished things that we value and we will have to make sacrifices in many areas. Then what the Lord wants to teach us will become a reality in our lives - and we will fulfil the whole plan of God for our lives. Building the New Covenant Church is an area that God has made very precious to me. The path to it is, however, a very, very narrow one. Jesus said that new wine must be put into new wineskins. The new wine is His life that He wants to give us through the Holy Spirit. The new wineskin is the New Covenant Church that He wants to build through us, in which this life is to be manifested. If we sincerely seek to live this New Covenant life, we will discover that we have to peel off many layers of selfishness (like the layers of an onion), as God shows them to us a little at a time. The same is true, when we seek to build a New Covenant Church. The old wineskin is a church built on human traditions rather than on God's Word. This also has many layers. As the Lord shows us those layers we must peel them off. Unfortunately, many Christians who seek to build New Covenant churches stop short at some point - when there are many layers of the old wineskin still to be peeled off. They have peeled off only some of the obvious human and denominational traditions that they have grown up with. But the Lord wants us to get rid of the old wineskin completely. He wants His new wine to be contained in a totally new wineskin. For many years, I knew the teaching about the new wine and the new wineskin and what it really meant to build the Church as the body of Christ - theoretically. But all of it was only head-knowledge, accumulated by hearing more sermons about it than others had heard. Growing up, I heard sermons about the New Covenant by my Dad every Sunday. I also heard him at home, Monday through Saturday. But all of it was still only in my head. It took many years for those truths to descend from my head to my heart, when I finally realized that this was the only way that I could serve the Lord. Jesus is the only Person for me in my life now. Every other relationship comes out of my relationship with Him. And, therefore, building the Church as the Body of Christ is the only thing for me in my service for the Lord now. Why did our Lord Jesus choose the way of the cross every single day of His earthly life? The Bible says that it was because of "a joy set before Him" (Hebrews12:2). What was that joy set before Him? In John 14, we read Jesus' parting words to His disciples before He went to the cross. I really appreciate the fact that the apostle John took five chapters to tell us the parting words of Jesus at the last supper. There Jesus said, "Arise let us go from here" (John 14:31). He was going to His crucifixion. But before saying that, He said, "That the world may know that I love the Father, and as the Father gave Me commandment even so I do" (John 14:30). That was His joy - the joy of always being in submission to His Father and thus being in fellowship with Him, as it had been for Him from all eternity. So, Jesus went to the cross first of all, out of love for His Father and submission to His command - and then out of love for us. I want to emphasize this point because that is the only way we can build His Church as well. All desire to overcome sin and to do the Lord's work must come first from a love for the Father leading to obedience to His commands - and secondly from a love for people. We need to have compassion for people, if we are to build the Church. But before that compassion, there must be a love for our heavenly Father - a passionate love that makes us want to obey His commands. These are the two vital requirements needed to build a New Covenant Church: Love for the Father and love for others. These can be represented by the two planks of the cross - the vertical plank and the horizontal plank. 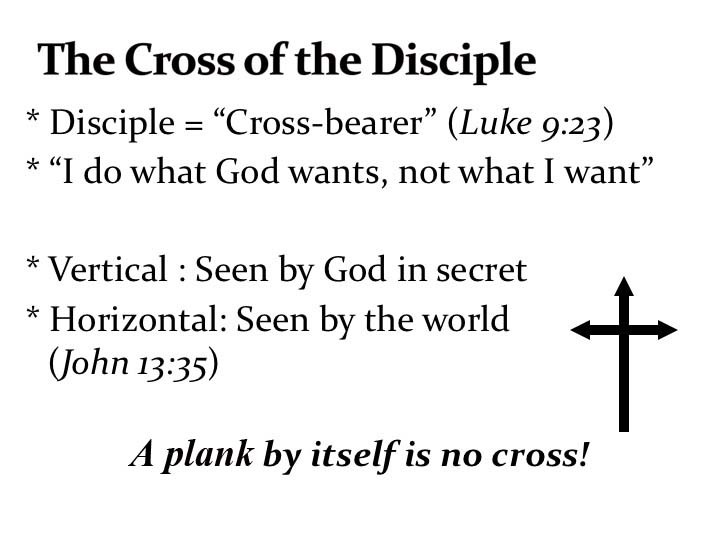 With just one of those planks - the vertical or the horizontal alone - you don't have a cross. In the cross, we see a beautiful picture of the two-way relationship that defines how we should carry the cross every day of our lives. In the subsequent chapters, I want to point out what it means to have both planks of the cross in our lives, and how these two together can help us build New Covenant Churches. The vertical plank of the cross represents love for God our Father - and that must come first. When they built the cross on which Jesus died, they would have started with the vertical plank first. And that plank had to be about twice the size of the horizontal plank. The symbolic meaning of that is that the vertical relationship with our Father in heaven is most important. That must come first. Only after that, must come the horizontal relationship with others. Before Jesus carried the cross up to Calvary's hill, He had carried an inward cross throughout His earthly life. He had carried an inward cross every day for the 12,000-plus days of His earthly life. And He says to us, " If you want to be My disciple, you must take up your cross everyday as well" (Luke 9:23 - paraphrase). The principle by which Jesus lived every one of those 12000-plus days on earth was this: "My life is determined by My love for My Father first of all, and obedience to His commands; and then, by My love for others." That was why Jesus could spend 30 years in His home living in subjection to His earthly parents. How many temptations to be disobedient and to be irritated He must have had to overcome, in order to obey imperfect Joseph and Mary implicitly every day for 30 years. But He did that joyfully because of "the joy set before Him" - the joy of fellowship with His Father through obedience to His Father's command that said, "Honour your father and mother". That attitude of taking up His cross and obeying His Father in every area, continued until the end of His earthly life. Jesus Himself was the first Body of Christ - and He carried the cross every day for 33½ years. Today, we, the members of His spiritual Body, must do the same. The Church of Jesus Christ must be a Church of disciples, and not just of converts. A disciple is one who denies his Self-life and carries his cross every day (Luke 9:23). So, if we want to have the new wine (the life of Jesus) in a new wineskin (a New Covenant Church), we must deny ourselves and take up our cross every day and follow Jesus. Only then can we build the Church as the Body of Christ. For building the Church, the vertical relationship with our Lord is most important. And this relationship with the Lord is a secret one, in our private life. The devil deceives many Christians into thinking that their devotion to God is what appears on the outside. But true devotion to God is 100% inward - in the secret place. It is in our hidden life. The New Covenant is primarily about inner attitudes and thoughts and motives. In the sermon on the mount, Jesus spoke about the hidden life. In the New Covenant, it is no longer a question of merely avoiding adultery (as in the Old Covenant). Now, we have to hate sexually sinful thoughts as well. In the Old Covenant, what mattered was how much you gave, and how much you prayed and fasted. But Jesus came and said that we must now give and pray and fast in secret, without letting anyone know that we are engaged in those activities. This is the new wine of the New Covenant. If we haven't understood the importance of hiding our inner devotion to Christ, then we haven't understood the fundamental principle of the New Covenant. Our devotion to Him must always be in secret. Our life must be "hid with Christ in God" (Colossians 3:3). This is a wonderful way to live. The more we hide our devotion to Christ from others, the more we will learn the secrets of the Lord. We must have times of intimacy with our Bridegroom in secret that no one knows about. The best marriage is one where the husband and wife have learnt the joy of each other's company without anybody else being with them - without anyone even being aware that they are spending time with each other. Jesus is building His Church today with people who have this spirit of a devoted Bride. Once the vertical plank (our love for the Father and a fervent devotion to Christ) has been laid down, then the horizontal plank (our love for one another) can be laid across it. Then the cross is complete - on which we can joyfully lie down and be crucified!! If you try to hang a horizontal plank in the air, it will fall down. But if you nail it to a vertical plank, then it will stand firm - and become a cross. The vertical plank, however, must come first. The churches that we build must be New Covenant churches. Such churches can be built only by those who determine to live by this principle: "I do not want to do what I want to do. I only want to do what my heavenly Father wants me to do" . Sadly, the vast majority of Christians do not have this attitude. My own life was also once like that. I sought my own and did what I wanted to do, while calling myself a believer! I wanted to be a part of a church that fitted with my own ideas of "church". I wanted to build fellowship with people who were like me in every way. I spent my time with people I liked. And if some brother rubbed me the wrong way, I would avoid him. That was not walking the way of the cross. We can never build the body of Christ if we hold on to that mentality. It is possible to receive excellent teaching and yet not walk the way of the cross. Who is a True Disciple of Jesus? For many years I used to think that the proof that we were disciples of Jesus was that we loved one another, because Jesus said, "By this all men will know that you are My disciples, if you have love for one another" (John 13:35). I thought that meant that I prove that I am a disciple by loving my brothers and sisters in the church that I attend. But if you read that verse carefully you will notice that it is referring to the evidence that we are disciples - the way that others (non-Christians) identify us as Jesus' disciples. That is the horizontal plank of the cross. But Jesus had said earlier, that the condition for being a disciple was denying our Self and crucifying our self-will (Luke 9:23). God has to first see that you are a disciple in those areas of your life where nobody sees you - in your heart, in your inner life. When God sees that you deny yourself daily, He attests you as a " Luke 9:23 Christian" - and that is the only kind of Christian there really is . "The disciples were called Christians" (Acts 11:26). After that , the evidence to the world around you that you are a disciple of Jesus will be that you love other disciples of Jesus. But notice, again, that the vertical plank comes first - God being able to attest to your love for Him. So, don't be deceived into thinking that if you love others in your local church you are a disciple of Jesus! A human love for others can deceive you into thinking that you are a disciple. If you love to be with other believers on Sundays, that doesn't prove that you are a disciple. You prove that you are a disciple on Monday, Tuesday, Wednesday, Thursday, Friday and Saturday, when you don't necessarily meet with other believers - by denying yourself and loving Jesus fervently. In other words, you live before His face day after day. As I said earlier, a plank by itself is no cross, whether the vertical plank or the horizontal plank. Unfortunately, most believers and most churches fall into one of these two categories - emphasizing the vertical plank alone or the horizontal one alone. And the last of these three is the only one that is the new wineskin for the new wine. 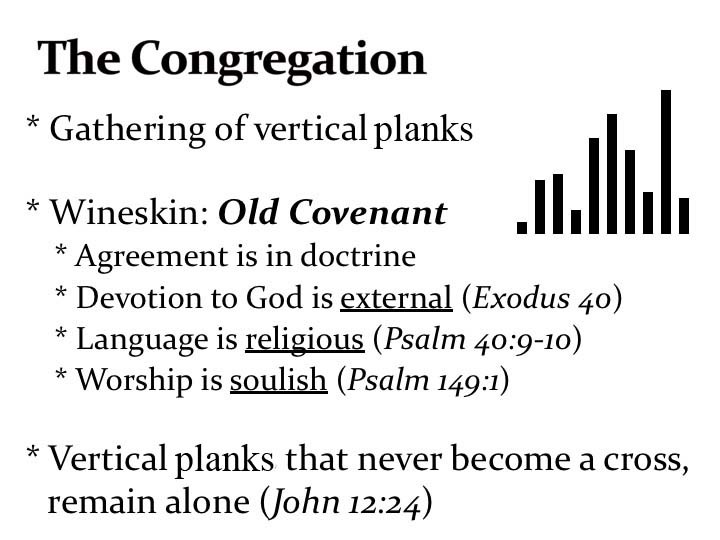 The Congregation is a gathering of vertical planks. Many churches that I have been to are like this. In a good Congregation, the people are interested only in their personal walk with God, in Bible studies and in doctrinal purity. But they are all individual planks of different sizes (different levels of devotion to the Lord). They do not build fellowship with each other - and they avoid anyone who rubs them the wrong way. I myself was a Congregation member for many years. Having heard many wonderful truths for many years, I was satisfied that my personal walk with God was alright. But, like John says " How can you claim to love God when you don't love the brother whom you see?" (1 John 4:20). And that is a verse that people in "Congregations" don't pay much attention to. What John is saying there, is that you may think you have a cross just because you have a vertical plank. You have some level of outward holiness, but you have no fellowship with others in your Congregation. In the Congregation pattern, people are isolated brothers and sisters who do not seek to build fellowship with each other, even though they may have friendship with them. They do not spend time together to build each other up in love. This is how it was under the Old Covenant in Israel. In such a system, even a husband and wife may not have much fellowship with each other, because one of them is "super spiritual"! For example, say, the wife is overburdened, taking care of the children, while the husband is busy having his "quiet time" meditating on God's word instead of helping her! Such a man has "Congregation" mentality. I wonder whether such a person can really be called a Christian. He can imagine that he is spiritual and a disciple of Christ because he reads the Bible, prays and gives money to the church. But, it is all self-deception. The devil has fooled many Christians like that - just as he fooled me also for many years into thinking that my external "Christian" activities made me a disciple of Christ. This is Old Covenant religion - and the word 'congregation' is really an Old Covenant word. When Moses gave the Law to the Israelites they were a congregation. When God gave them detailed commands about how they should worship when they gathered together, they were a gathering of separate individuals. They were individuals whom God was inviting to live a holy life. In Israel's history, they had "solo leaders" like Moses and " solo prophets" like Elijah. But we never see two leaders or prophets there working together or building fellowship with each other, and doing the work of God together in Israel. Such fellowship is possible only under the New Covenant. It is the principle of " new wine in new wineskins". Under the Old Covenant, the Israelites just took care of their own lives and their families. Even if some of them were holy, they did not fellowship together with others. The word "fellowship" did not exist under the Old Covenant. They were "lone rangers" - some of whom may have loved to do things for God. But they did not long to build fellowship with one another in a "body", or work together with each other as members of one "body" - becausethey could not be a body under the Old Covenant. They were just a congregation. But now the New Covenant has been established by our Lord. When we are born again we receive the life of Christ - the new wine. This life is not meant to be lived individually (in the old wineskin). If we try to fit this life of Christ into a selfish lifestyle - where we think only of ourselves and our family, without building fellowship with other born-again believers in our local church - then, as Jesus warned us, our life (the old wineskin) would burst. God fills us with His Holy Spirit (the new wine) and wants it to be poured into the new wineskin (the Body of Christ). I know there is hope for every one of us to enter into this, because I see what God did for me. God had mercy on me, when I was a " Congregation" Christian, and everything burst in my life and fell apart. Then God told me (as it were), "Will you now let me put this new wine into a new wineskin?" The good thing about the "bursting" was that it got rid of the old wineskin! It was good that God allowed my old wineskin to burst. I realized then that I had put my faith in what was earthly, and not heavenly. I had put my faith in the traditions of men and my own ideas about building the church. Devotion to God is often merely an external thing for many Christians. They attend all the meetings of the church, they pray, they sit reverentially, and they all talk religious language. Such external actions can make them imagine that they are spiritual. But you cannot talk with them about practical aspects of everyday life, because such conversation would be considered "unspiritual and worldly"! They can only talk about "religious" matters. It is a false Christianity that does not permit us to talk about ordinary, everyday matters with each other. When Jesus spoke to His disciples and to the people around Him, He wasn't always quoting Old Testament verses to them. He did that when it was needed - for example, when He spoke to Satan or when He answered the questions of the Pharisees. But most of the time He spoke to His disciples about ordinary, everyday matters. He never acted or spoke with a false spirituality. And thereby, He has shown us what the new wine really is. Using religious language can give us the false impression that we are building the church with others around us who also speak the same religious language. We can quote verses to one another and share what we got from those verses in the meetings - and imagine that to be spirituality. But that will only result in a soulish life. Think of the mega-churches nowadays, with congregations of thousands of people. Within them, there may not even be two people who have genuine godly fellowship with each other. They are drawn together by powerful soulish music and eloquent soulish preaching. That is not an expression of the Body of Christ. These are gatherings of vertical planks who individually think of their relationship with God alone. But it is a deception, because there is no horizontal plank. And so, there is no cross. Jesus said, "Unless a grain of wheat falls into the ground and dies, it remains alone" (John 12:24). Genuine fruit that lasts for eternity can come only from grains of wheat dying to themselves. 10,000 individual grains can be kept in a golden showcase on display, and that will impress the world. You can see thousands of such grains of wheat, sitting next to each other in the pews of mega-churches. When I see that, I think, "If even two of those grains had been willing to die to themselves and to build fellowship with each other, God could have begun a work among a remnant there, that could truly manifest the Body of Christ to the world around them". May God save us from ever gathering large numbers of people in our church, who are all grains of wheat that are unwilling to fall into the ground and die. God begins with one grain of wheat that is willing to fall into the ground and die. Then He adds another to that one, and then another, and then another. This is how the Church is built as the Body of Christ which can feed a hungry world. But, grains of wheat that do not die can only tease the hungry, needy people in the world with the pretense of what they could be - pictures of bread, rather than true bread. Jesus said that when a grain of wheat falls into the ground and dies, it will ( definitely) bear much fruit. A grain of wheat is so small that if held between your fingers, you can hardly see it. Even so, you may be a small unknown group of a few believers meeting somewhere, denounced and despised by other Christian groups and churches. Don't get discouraged. Other mega-churches around you may have their famous pastors who give impressive reports about their work and earn huge salaries and drive fancy cars. Let them do all of that. Don't envy them. Our calling is to fall into the ground and die. The Lord will bring forth fruit from us that will last for eternity. That is His promise. That is the secret of building the true Church. The "Club" is the opposite of the Congregation. The Congregation, we saw, was these vertical planks of different sizes stacked next to each other - some of them having more devotion to the Lord, and others having less. But they don't have fellowship with one another. The Club, however, is made up of people who care for each other. This is perhaps a greater danger for some, because it is easy to compare ourselves with the Congregations around us and say, "Okay, we are all going to care for one another now". So, we talk nicely to each other and think we have good fellowship with each other. It is easy, then, to imagine that we are spiritual because we all think alike doctrinally, we all dress similarly, etc. But we are still only wooden planks - all cut to the same size out of the same mould! The greatest danger for us, when we have understood the importance of horizontal relationships with each other, is that we become a Club. We invite others to join us, but we expect them all to be like us, to speak like us and to act like us. Thus, we become a club of people who are all exactly alike - or, as some say, "cookie-cutter Christians" - all cut in the same shape and size! Our relationship with each other is then based on the fact that we all speak the same religious language. We may be able to get along even with people of a different community and a different language, because they are still intellectually like us. But if another brother joins our church who is not so well-educated, and not so well-versed in our doctrines, then we may find it difficult to get along with him. So, we keep him at a distance, and eventually he falls away and leaves our Club. He didn't fit into our mould. The wineskin of such a Club is one without either the Old Covenant or the New Covenant. There is no covenant there at all. The Congregation was based on the Old Covenant - some devotion to God, but without mutual fellowship. You can react to that, however, and end up in a life with no covenant at all. Many Christians are like that. They feel that God has set them free from the Old Covenant and the Law, and they end up having no covenant at all. Such people love Paul's letter to the Galatians, misunderstanding its teaching of being "free from the law". They don't want any covenant at all. But without a covenant there can be no marriage to Christ. When my wife and I were married, we entered into a covenant. Though there is no rule book in marriage, there are some rules - rules based on love. For example: I will never cheat on my wife, by God's grace. This is not because of rules that I find in some rule book on marriage that says, "You shall not do this or do that once you are married". I am faithful to my wife because I love her. I never want to do anything that would harm her because I love her. In our marriage to Christ too, there are some rules - on the same basis - because He loved me first, and because I love Him with all my heart. My relationship with Him is not based on any book of rules, but on the law of love. The Club however has many rules. 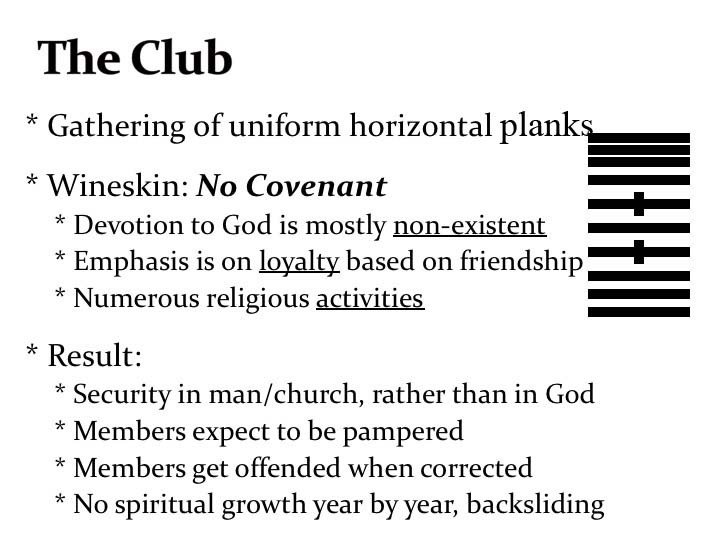 If you want to be a part of the Club you have to fulfill certain requirements - rules that go beyond God's laws - mere traditions of men. When you are under no covenant with God, you have to make your own covenant in your relationship with others. " You scratch my back and I will scratch yours. You treat me nicely, and I will treat you nicely. But the moment you stop treating me nicely, I am finished with you ." Many believers have this type of a relationship with others. The Club, however, gives you some earthly privileges. You can attend the "church conferences", your children can meet with other good children there, you can get married there - and, you can even get a decent burial when the time comes for that!! When believers only build friendship with each other like this, they are simply a bunch of horizontal planks. Some of them may have a little devotion to Christ, but that vertical plank is very small. In most cases, the vertical plank is non-existent. Don't wake up at the judgment seat of Christ and discover that you were just a part of a good Christian club. Did you join your "church" because your husband or wife or someone else dragged you into it? Did you join it because you liked the "Club atmosphere" there, where you could listen to good sermons and where others would help you when you were in need? When you listen to good teaching, you can easily deceive yourself into thinking that you are spiritual just because you understand it. And you can congratulate yourself because the teaching in your "church" is superior to that in other "churches". Yet the vertical plank of devotion to Christ may be totally missing in your life. If so, then you will have a tragic surprise at the judgment seat of Christ - when you find yourself outside God's kingdom altogether! At the security check-point in airports, there is a conveyor belt on which passengers place their bags. Those bags go through a security scan and finally come out on the other side. I have pictured the judgment seat of Christ to be somewhat like this. But, instead of a scanning machine, it will be a big furnace! And God will send our entire life's actions one by one through that furnace. What comes out on the other side will depend on how we lived our lives here on earth. 1 Corinthians 3:13-15 states that for many believers, everything they did will be burnt up - because it was all like wood, hay and straw. Nothing will come out on the other side. Many who sat in good "churches" for years will discover to their dismay in that day, that they had wasted their entire earthly lives. There will be many who attended good "churches" for many years and heard wonderful messages (in their "church" and on-line) to whom the Lord will say "Your earthly life was wasted, because you did not have a personal devotion to Me. I never 'knew' you and you never 'knew' Me. You never walked with Me. You never took up the cross" (Matthew 7:22-23). That will indeed be sad. Secure in the Lord or in the Church? The Church of Jesus Christ is the most enjoyable place for me on earth. I mean that from the bottom of my heart. The fellowship of the saints is so sweet. But that will never be greater than the fellowship I have with my heavenly Father and with the Lord Jesus. The fellowship that I experience with Jesus and the Father will never be broken throughout my earthly life and will continue throughout all eternity. And it is on the basis of that fellowship that I experience fellowship with God's people even now. Those who are in the Club however, find their security in that Club and not in the Lord. They find their security in listening to godly men. You may have listened to hundreds of sermons this year. But that does not make you a true disciple of Jesus. Those who are in the Club also expect to be pampered and coddled constantly; and they get offended easily if they are not treated as someone "special". They seek for honour and approval from men. They seek to be visible publicly and want to be treated nicely by others. If an elder were to give them a word of correction at some point, they would get offended immediately, and eventually leave the Club! The Lord has shown me that if I ever get offended when a godly, older brother corrects me, that would prove that I am just a "Club" Christian. Others around me may be experiencing the true life of Christ. But I can sit among them for years and years, only to discover at the judgment seat of Christ, that I was only a good Club member. May God save us from ever getting offended by correction or rebuke. God has given us elders and godly older brothers who love us, who speak God's word to us in love. They do not spare the rod because they know that fathers who love their children never spare the rod. Such elders love us, as our heavenly Father loves us. If, then, you rebel or get offended with what such godly older brothers say to you, that would be a sure sign that you have Club mentality. The end result will be a lack of spiritual growth. And if there is no spiritual growth in your life, you are backsliding. There is no such thing as being stationary in the Christian life. If we get offended when a godly older brother speaks a word of reproof to us, then we are certainly in a backslidden condition - perhaps on our way to hell. Hebrews 12:5-8 encourages us to love the discipline of our heavenly Father, because He does it out of love for us. Likewise, the elders in the church who have the heart of a father (like Paul, in I Corinthians 4:15) also correct us out of love, so that we don't backslide and become lost. If we become resentful over this correction, then we prove that we have Club mentality. Eventually, we will be the losers. In the New Covenant, there are a number of words that are new - that are never found in the Old Covenant. One such word is "fellowship". On the day of Pentecost, when three thousand people were born again in a mighty revival, they did not decide to have tent-revival-meetings for the next ten days. That is what people do nowadays! Instead, God told those disciples to shut down the "revival meeting" and to go and build the church. We read in Acts 2:42, that "they devoted themselves to fellowship ". That is the first time that that word comes in the Bible! * It is the translation of the Greek word "koinonia", which means " sharing together". This fellowship was the immediate result of those disciples being filled with the Holy Spirit. When Christians claim to be filled with the Holy Spirit today, they say, "I spoke in tongues", or "I prayed for a sick person and he was healed (at least, I think he was healed! )", or "I preach eloquently now", etc. But on the day of Pentecost, when they were filled with the Holy Spirit, we read that those believers went away from the revival meeting and built fellowship with one another (Acts 2:42). That must be the primary result of being filled with the Holy Spirit. In 1 Corinthians 12:13, we read that, " by one Spirit we are all baptized into one Body". The Church is described there not as a Congregation or a Club, but as a Body. "You are Christ's body and individually members of it" (1 Corinthians 12:27). This body is built on the basis of the cross. This wineskin is the New Covenant Church. The Congregation is an Old Covenant concept. The Club has no covenant at all. But the true Church is built on the basis of the New Covenant. We don't use the word covenant much nowadays. It means an agreement and a commitment among those who are building the Church of Jesus Christ. They have made a commitment to the Lord their Bridegroom, first of all, and then a commitment to one another. There you have the two planks of the cross - the vertical and the horizontal. They love the Lord fervently first, and then love one another. This is what is symbolized in the "breaking of bread" in a local church. We state thereby that we are in fellowship with the Lord and want to die to Self as He did (1 Corinthians 11:26-28). We also state thereby that we are in fellowship with one another as members of His Body (1 Corinthians 10:16, 17). That is why there is one bread, and many of us partaking of it together. Our love for one another is not a human love for those whom we like - "I like you, you like me, we're a happy family!" No. It comes out of our love for the Lord. In the same way, it should not be our love for lost humanity that drives us to go out as a missionary to evangelize them. The love that drives us to give them the gospel must flow from our love for the Lord. It is this love for the Lord and for others that is shed abroad in our hearts by the Holy Spirit (Romans 5:5). I have heard my Dad (Zac Poonen) use this illustration to show the difference between the Old Covenant ministry of the Holy Spirit and the New Covenant ministry of the Holy Spirit: In the Old Covenant, man's heart was like a cup with a lid on it (like the veil that closed up the most holy place in the Jewish temple). The Holy Spirit was poured out on this closed lid of the cup and He flowed over it in rivers of blessing to multitudes around - as He did through Moses, John the Baptist, etc. But in the New Covenant, the lid is removed (2 Corinthians 3:12-18). This was symbolized by the veil in the temple being rent when Jesus died, and the way into the Most Holy Place being opened up. Now, when the Spirit is poured out, Hefills the cup first - cleanses the believer's heart first - and then flows out "from his innermost being" in blessing to multitudes, as Jesus explained in John 7:37-39. 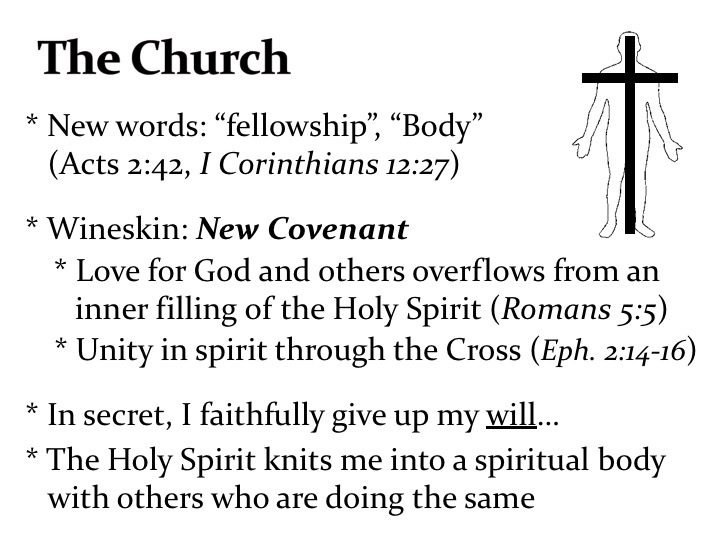 This is how the New Covenant Church is built. If we are still trying to use the Holy Spirit only to preach to others, then we will only build a Congregation or a Club. But if we allow God to fill us and shed abroad His love in our hearts first of all, then He can flow from our innermost being to others. Then we will build the Church with others who also have the same spirit of fellowship. Love for God and for others will overflow from our hearts, and true unity of the spirit will be built through each of us taking up the cross. In reality, the true Church is built up primarily when we are away from each other. It is not built only when we gather together at our Sunday meetings. Yes, it is built there through the gifts of the Holy Spirit. But, it is built even more so when we are away from each other. When we are being tempted in some way - to be dishonest, or to be angry, or to lust with our eyes, etc. - that's where you prove whether you are part of Jesus' Church. In these temptations, if we take up our cross, die to ourselves, preserve our devotion to the Lord, and resist sin, then we walk in the light and have fellowship with the Lord. Then, when we meet together with each other, we will have real fellowship with each other (I John 1:7). Colossians 2:2 speaks about our hearts being " knit together in love". I cannot knit myself to others, in love. Only the Holy Spirit can do this work of knitting our hearts together. If, however, I try to knit my heart to yours in some human way, by giving you gifts, or by spending time with you, etc., I will only build aClub. But God says, "Just die to yourself". When I do that, the Holy Spirit will do the work of knitting my heart in an invisible, supernatural way, with the others among whom he has placed me in a local church, who are also dying to themselves. Our fellowship will then become sweet - not because we believe the same doctrines or sing the same songs, but because we have both fallen into the ground and died to our Self-life. We come into fellowship with each other, thus, through the Holy Spirit. Any unity that we have, without dying to Self, will only result in friendship, and not true Christian fellowship. Fellowship is a spiritual thing, but friendship is an earthly thing. The people in the world have friendship. The members of many worldly clubs have a lot of close friendship with each other and care for each other deeply. But they can never have true fellowship - because that is a spiritual work that only the Holy Spirit can do in our lives. When God sees any child of His " bearing the dying of Jesus in his body", He rewards him by giving him something more of "the life of Jesus" (2 Corinthians 4:10,11). It is this "life of Jesus" within two believers that brings true fellowship between them. And with such people God builds His New Covenant Church. When I began to see these truths, I stopped asking the Lord, "Lord, where are the people who want to build Your true Church?" I realized that God would find them and bring us together - if I myself was first willing to fall into the ground and die. If I refused to die, then God would not bring them to me. Trying to find wholehearted believers around us is like trying to find " needles in a haystack". We could spend many years searching in the pile of hay for those tiny needles in that pile; and perhaps find one needle after many years of effort. But the Lord says, "Don't waste your time looking for those needles. I know where they are. Just fall into the ground and die to yourself." Then the life of Jesus in you will become such a powerful magnet, that it will draw those "needles" (wholehearted disciples) out" (John 1:4, 12:32). Other believers who are also seeking to live a godly life and to build the New Covenant Church will be drawn to you and to the message of the cross that you proclaim. That is God's way. He brings the wholehearted ones to us. "All whom the Father gives Me will come to Me", Jesus said in John 6:37. And the Father will do the same for us too. That is how we build the New Covenant Church. In Jeremiah 3:14 the Lord says, "I will take you one from a city and one from a home and I will bring you to Zion and there I will give you shepherds after My own heart." What a beautiful promise that is. You know you have come to the true Church when you have found shepherds after God's own heart. Learn to respect them and don't get offended when they correct you, because they are seeking to lead you to godliness. Ephesians 5:25 says, " Christ loved the church and gave Himself for it". There is no way to build the Church without personal sacrifice. It was a great sacrifice that Jesus made when He came from heaven to earth. He sacrificed comfort and ease and lived in poverty. But above all, He gave Himself. Don't ever imagine that you can build a New Covenant Church without paying a price. 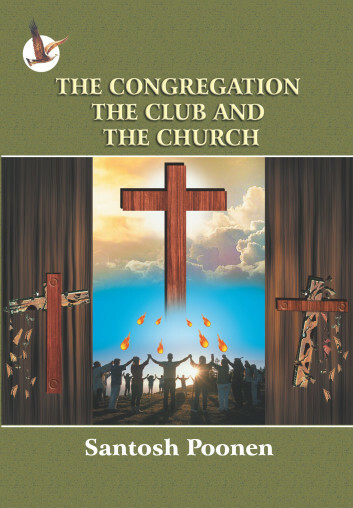 Those who want to build the Church, but don't want to make any sacrifice of money or personal convenience, will only build aCongregation or a Club.The true Church cannot be built without sacrifice. Christ gaveHimself to build it. We too will have to give up our "Self" to join Him in building it. The Lord can use even the smallest and most useless person to build His Church, if that person allows himself to be filled with God's Holy Spirit and walks the way of the cross. If you are small in your own eyes, then God says to you today, "You are a small, insignificant grain of wheat. Go and fall into the ground and die." Then you will see the miracle that God will do through you. Your eyes cannot see today and your mind cannot imagine today what God is ready to do for you and through you in the coming days (1 Corinthians 2:9). But, you must love Him enough to listen to His call that is coming to you through this book. When Jesus lived on earth, His "church" was extremely small. It consisted of twelve men, of which one became a traitor. But, the remaining eleven were true disciples who had forsaken everything to follow Jesus. As a result, they would turn the world upside down after they were filled with the Holy Spirit. Before this, however, they would often argue with each other. At one point, when Jesus told them that He was going to be crucified, the disciples immediately did what any earthly-minded person would do when a leader leaves his position - they started to argue about who would take over the leadership (Mark 9:31-34). A short time later, Jesus told them again that He was going to be crucified and raised up on the third day (Matthew 20:18-21). Again, the disciples, beginning with James and John, expressed their desire for positions of greatness. They saw Jesus' being glorified as an opportunity for them also to be lifted up in front of everybody. Jesus replied to them that He " did not come to be served, but to serve, and to give His life…" (v28). Jesus was showing us that there are two types of people in the world - even among those who call themselves "Christians" - the "takers", and the "givers". Christians who have the spirit of this world (Congregation Christians and Club Christians) aretakers who are always looking for what they can get out of Christianity. Those of the true Church, on the other hand, are givers. They are always looking for what they can give - first of all to God, and then to others. Jesus said that the givers are the ones who get the most blessing (Acts 20:35). The higher you rise in this world, the more you can expect to be served by others. The rulers of the world's governments have people constantly serving them. If you progress in the kingdom of heaven, on the other hand, you will serve others more. Jesus not only taught this, but lived it out throughout His life. In a church, takers always expect others to meet their needs. If their expectations are not met, they will eventually get offended over something or the other and leave the church. Givers, on the other hand, when they see a lack or a need, will take responsibility as members of that church family, and faithfully work with endurance to meet those needs through God's grace. For example, if there is a lack of love between you and another person in your local church and you feel like your "love cup" is empty: You could view the problem as the other person's fault, for not pouring enough love into your relationship to fill up your cup. This is the mentality of the taker. Instead, if you have the "giver mindset," you will bring this lack to God, and ask Him to fill your cup. He will then fill it to such overflowing that love will pour out of your life into those around you. We read in 2 Corinthians 9:6-8 that God wants to pour out His grace abundantly upon us. When reading this verse, it is easy to selfishly think of it as accumulating more and more for ourselves. But if you read this passage carefully, you will see that God gives us such overflowing grace so that we can be givers who do good to others (see the last part of verse 8). Paul, who wrote this, had laboured in the church in Ephesus for three years. When he said goodbye to them the final time (Acts 20:25-35), he reminded the elders that during that entire time he had lived among them as a giver. That's why he says that even though he would have been entitled to be financially supported by the church, he refused it. He not only provided for his own needs, but also for the needs of the others who were with him. He had a "maximum" attitude toward being a "giver"! That was why God could use him to the maximum extent in building the Church. The reason that many people don't want to be givers is that it involves sacrifice - a "cup of suffering" - as Jesus explained later on in Matthew 20:22-23. But, the Church can only be built through sacrifice. So, as we see needs in the church around us, let us come to God as thirsty people, and ask God to fill us with His power deep in our innermost being. From that innermost place will flow rivers of living water (John 7:37-38) that will water the parched ground around us and build the Church. The Bible speaks about two ways by which a house can be torn down. One is by storms that attack the foolish builder's house which does not have a solid foundation (Matthew 7:26-27). The other is by a foolish person living inside the house who chips away at the house "brick by brick" (Proverbs 14:1 Message) until it comes crashing down. As I observe churches throughout history and in the world today, I see that more churches have been destroyed by its own members tearing them down, than through attacks from outside. In fact, where Satan has persecuted theChurch through external forces, that has usually served only to preserve the Church in purity. So, Satan is quite content to let Christians themselves do the work of destroying the church from within. Thus, even where God has been able to call people out ofCongregations and Clubs to form an expression of His Church through a local body of believers, Satan can still eat away at that work from the inside out, if the members of the church are willing to do that work for him. Can the Devil succeed in doing this even in a spiritual church? Certainly! He started by doing it in heaven itself - in the very presence of God - when he successfully drew away one-third of the angels with him in rebellion (Revelation 12:4), causing them to become evil spirits. The first century church also experienced this many times in the form of savage wolves (Acts 20:30), and men like Alexander the coppersmith (2 Timothy 4:14-15) and Diotrephes (3 John 1:9-10). In order to avoid this, we must identify the source of these conflicts that tear down churches. James 3:13-4:1 explains this clearly. The source of such conflicts is Self-pleasing (4:1), which manifests itself in bitter jealousy and selfish ambition (3:14), and eventually spreads throughout the church resulting in disorder and every other kind of evil (3:16). That's why we are warned in Hebrews 12:15 to ensure that bitterness is dealt with when it is still a root (in the heart and in the thoughts), because if it does actually spring up, it will defile many. It is important to note that we have only two options (based on Proverbs 14:1): We are either going to actively build up the church, or we are going to tear it down. Actively building up a church is done through love (1 Corinthians 8:1). This means not just saying that we love each other in the church, but actually living it out (1 John 3:18) and not being hypocritical about it (Romans 12:9). The quality of our love is tested especially in situations of disagreement or conflict, where we prove that we have true love by giving up our "Self-life" for the church like Jesus did (Ephesians 5:25). This also means interceding on behalf of others in the church like Jesus does for us (Hebrews 7:25). In Revelation 12:10, the Devil is called the " accuser of the brethren." Tearing down a church happens when members of the church partner with him in accusing other believers. We see a picture of this in the life of Zechariah, a young prophet whose calling was to lead God's people in rebuilding the temple in Jerusalem after their return from captivity in Babylon. In Zechariah 3:1-5, we see Joshua the high priest clothed with filthy garments, and Satan standing beside him to accuse him. Even before the Lord removes Joshua's filthy garments, He rebukes Satan first. Then the Lord replaces Joshua's filthy garments with beautiful new robes. But, why was Zechariah there? It was a test to see which side he would take - the side of the accuser, or the side of the Intercessor. Zechariah shows us what it means to be a builder of God's house. As soon as Joshua was clothed in beautiful, new garments, Zechariah decides to make him even more glorious by asking for a turban to be put on his head. Today, we face the same test as we seek to build the Church as a dwelling place for God. On the one hand, the Devil invites us to be part of his "tearing down" ministry by allowing accusing thoughts against others to find a root in our hearts, and then spreading it through gossip against others in the church, and eventually splitting a church. On the other hand, Jesus invites us to be part of his "building up" ministry in choosing to intercede for others to make them more glorious - as He does constantly (Hebrews 7:25). Even where there is sin, our goal must always be to "win our brother" (Matthew 18:15). The Church where this is truly lived out, will have Jesus in its midst, and will thus have complete authority against all the powers of darkness (Matthew 18:18-20). In Matthew 9:37-38, Jesus said that there were very few workers to reap the plentiful harvest in the world. He then told us to pray that workers will be sent forth into the harvest fields. Many people use this verse to stir people emotionally into rushing out into some evangelistic outreach work. When we read verses 36-38 together however, we see what exactly Jesus meant when He spoke about "workers". When Jesus looked out at the multitude, He saw people with no lack of preachers and teachers (for there were many Pharisees and scribes); no lack of meetings (the people met in the synagogues on the Sabbath as well as at other times); and no lack of miracles (He had already done many miracles in their midst). What they did lack was shepherds. The same is true today as well. We live in an age where the Bible and doctrinal teachings are readily available in printed format, online, on smartphones, etc., and almost all churches hold services multiple times during the week. But God is still looking for leaders who will allow Him to break their hard Self-focused heart and replace it with a soft shepherd's heart. Way back in Jeremiah 3:14-15, God showed us two important characteristics of His Church ("Zion"): (i) they would be a diverse people from different cities and families, and (ii) He would give them shepherds after His own heart. What, then, does it mean to be "a shepherd after God's own heart"? Such a shepherd will have Christ's compassion. This is more than just human sympathy. This compassion is a spiritual emotion that is motivated by seeing people "harassed and thrown down" (Matthew 9:36 margin) by the Devil. This means caring more for their spiritual welfare than for their physical or emotional welfare, and being willing to boldly speak the truth in love. Such a shepherd will be willing to be inconvenienced. Throughout Jesus' life, we see that as the Father directed Him, He always went, even if it meant walking hundreds of miles, having to sleep out in the open, having to skip a meal, etc. He cared impartially for the famous like the synagogue official (Matthew 9:18-19) as well as for the poor like the woman with the hemorrhage (Matthew 9:20-22). Jesus lived and died "without a thought for His own welfare" (Isaiah 53:8 Message) - and true shepherds are those who follow His example in living this way. Such a shepherd will stand for the truth uncompromisingly. When the Jews were taken into captivity in Babylon, one young man, Daniel, purposed in his heart that he would not compromise God's standards (Daniel 1:8). His quiet boldness shepherded his three companions also to take a bold stand with him (Daniel 1:11). Such a shepherd will partner with the Holy Spirit in being a helper to others in their joy and their faith. This is how Paul describes it: "We're not in charge of how you live out the faith, looking over your shoulders, suspiciously critical. We're partners, working alongside you, joyfully expectant. I know that you stand by your own faith, not by ours" (2 Corinthians 1:24 Message). Such a shepherd will have spiritual authority. This is something only God can attest to, and it comes from the fact that when "the prince of this world" (Satan) comes, there is no area of our lives in which he has a foothold (John 14:30). Such a shepherd will have a compulsion to preach the full gospel of the kingdom of God. Many preachers like to speak on popular topics, and tickle the ears of their listeners (2 Timothy 4:3-4). Such men aren't shepherds. Paul, on the other hand, took his calling so seriously that he said he would have blood on his hands if he did not declare "the whole purpose of God" (Acts 20:26-27). Such a shepherd will lay down his life for the sheep. This means that he fearlessly stays with the sheep until the end, even if it means giving up his preferences, his needs, his comforts, or his agenda. Jesus contrasted this shepherding heart with that of a hireling who, when things get inconvenient or trouble comes, leaves the sheep and flees because he is not concerned about the sheep (John 10:11-13). When Paul examined the lives of his coworkers, he realized that all of them ultimately sought after their own interests. Only Timothy had a kindred spirit to him in having the heart of a shepherd, because he was genuinely concerned for the welfare of the flock (Philippians 2:19-21). I remember many years ago, the Lord asked me who were the shepherds to whom I submitted, who watched over my soul and could give account of my life with joy (Hebrews 13:17). I saw the example in Jesus' life who, because He faithfully submitted to every authority under whom the Father asked Him to submit - especially during His first thirty years - therefore had true spiritual authority (Matthew 8:8-9). I saw that with this spiritual authority, though beaten and bleeding, Jesus could boldly stand in front of even Pilate; and when Pilate tried to scare Jesus with how much power he had, Jesus quietly said, "You would have no authority over Me, unless it had been given you from above" (John 19:10). As the eyes of my heart were opened up to see the truth in these Scriptures, a fire was ignited in me to find Zion, the Church, where God would give me such true shepherds. I decided that no matter what the earthly cost - relatives, job, etc. - I would give myself wholeheartedly to building the Body of Christ. As with Isaiah, after God had cleansed me also of all sin and broken me, He asked me, "Whom shall I send, and who will go for Us?" (Isaiah 6:8). I have never regretted that decision I took in 2007, regardless of what the circumstances of the work before me looked like. If you have heard the call of God today to come out from theCongregations and Clubs in Babylon and build HisChurch in the spiritual "Zion", I hope your answer will also be, "Here am I. Send me!"